The Papa Bear is based on the book Muscular Portfolios (BenBella Books, 2018). The strategy is a clone of a 2013 whitepaper by Mebane Faber. 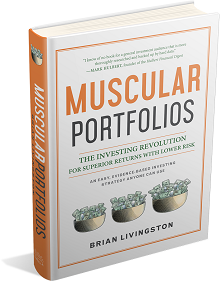 It is an extension of his book The Ivy Portfolio, which has been tracked with real money since 2006. The Papa Bear is designed to (1) keep losses small during bear markets, (2) underperform the S&P 500 with less volatility during bull markets, and (3) wind up with superior performance over each complete bear-bull market cycle. The investing menu consists of low-cost exchange-traded funds (ETFs) that track 13 asset classes. Your portfolio allocates roughly equal dollar amounts to the three ETFs with the strongest momentum, as determined by the strategy rules. The table below updates every 10 minutes during market hours. But don’t trade every day! Check and tune up your portfolio only once a month, on the same day of your choosing each month. Select any consistent day of the month to reallocate your portfolio. Momentum Rule: Before the market closes on your chosen day, note the three ETFs with the highest average 3, 6, and 12-month return (the green rows with a Buy percentage). If, because of a previous month’s rankings, you already own all of the ETFs in the green rows, do nothing. Sell any ETF you own that now has no Buy percentage. Use the cash from any sales to buy any indicated ETF you don’t already own. Exact percentages are not crucial. Hold each of the top 3 ETFs, whether the average 3, 6, 12-month return is positive or negative. Even if slightly negative, the strongest ETFs tend to rise in the following one month or more. There’s no need to rebalance the three ETFs back to their original Buy percentages unless an ETF is more than 20% off its target dollar amount. Average of 3, 6, 12-mo. return is equal to an ETF’s nominal total return (not inflation-adjusted but including dividends) over the average of the past 63, 126, and 252 trading days.